Shown here: ghost/house 18, December 26, 2005. Pieces by 4GETS and GERMS, throwie by DEON. Playing the catch-up game on the Ghost/House wall. I added eight more layers to this one, bringing it up to January 2006. 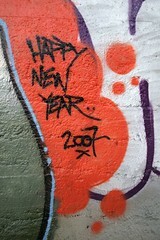 Thanks to Flickr user San Francisco Graffiti for filling in a missing spot in the record. The new layers feature work by NOVAK, UNITY, 4GETS, GERMS, DEON, FICKS, GHANA, PHADE, EURO, ZEROS, FEYN, DAGON, KAIZER, and others. I’ve had to turn off comments on this blog for now. I’ll turn them back on later, once I’ve had a chance to upgrade the CMS that runs this thing. Apologies to any actual human readers who may have tried to leave a comment in the past year– your comment is buried among some 25,000 pieces of robot spam, and I haven’t had time to wade through it all. Also, apologies to any robots who had something interesting to say in the comments. Your day will come. William Gibson, the original poet of cyberpunk, looks at “the mellowness of weathered, multi-level graffiti” and is reminded of “some endangered species of moss”. 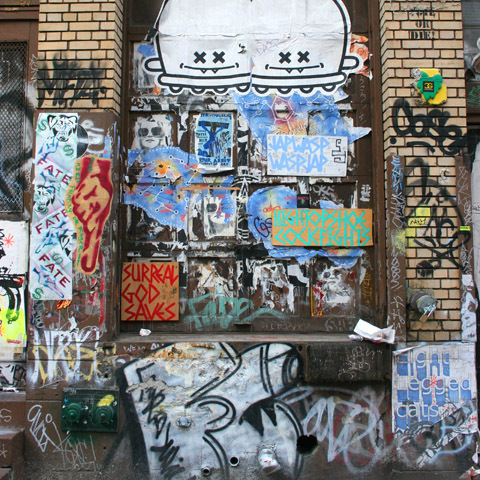 I love this comparison, as I’ve always seen graffiti as a kind of living thing with its own ecosystem. The particular graffiti he’s looking at is on the surface of a building known as the Candy Factory, not too far from 11 Spring Street. Above is a photo of the same spot taken just over a year ago. This isn’t the first time graffiti has figured in Gibson’s world. A reader in the forums pointed out that there’s a description in All Tomorrow’s Parties of an actual living tag made of smart paint, which battles against graffiti-eating bots embedded in the wall itself. How soon before life imitates art? Full Gibson quote below the fold. Shown here: cavern/north 8, January 20, 2007. 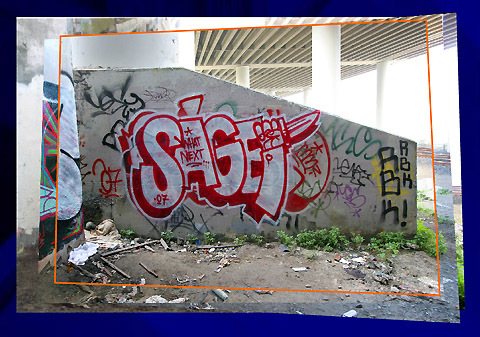 Throwie by Sager. Added some new recent layers to the Cavern, a once-great spot that has been mostly dormant since it got buffed in 2003. There’s some interesting back-and-forth going on between a few different writers (SAGE vs. SAZE, for example). Time will tell whether the spot grows back to its former glory, or gets buffed again. I also made some minor changes to the interface today: there are now keyboard shortcuts for panning (the arrow keys), zooming (+ and -), and centering (0) your view of the wall. There are some bigger changes I’d like to make soon, and this was a nice way to refresh my memory of Flash. Shown here: bluxome/eastA 7, January 14, 2007. Pieces by Neon and Apex. Catching up on San Francisco walls again, this time the eastern wall of the alley at Bluxome. Featuring fresh work by APEX, NEON, RIME, RUETS, LIONS, STEEL, STEREO, BEGR, and others. Follow the link above, and select “bluxome/eastA” (or eastB) from the menu to see the new stuff. Originally uploaded by jim and karla murray. Check out these photos of the work of NATE from Milan, Italy. Apparently he does this by selectively cutting away each individual layer on a wall plastered with years’ worth of posters. It’s like a physical manifestation of what we do at Graffiti Archaeology, using an x-acto knife instead of Flash! Shown here: candle/west layer 30, January 4, 2007. Photos by Adam Lawrence. Finally, the western wall of 11 Spring Street is up and running! There’s four years of history up there in a nice tidy package. This is the most collaborative wall I’ve assembled yet, featuring photos by no less than ten other photographers: C-Monster, Jake Dobkin, Goggla, guy_on_the_streets, ireallylovecake, Adam Lawrence, Rion Nakaya, Nicholas Noyes, Luna Park, shoehorn99, and myself. The wall itself tells quite a story, which I can only show you the highlights of at this point. There are many more in-between layers for me to add, particularly from the crazy weekend of Wooster on Spring. I just didn’t want to wait any longer to share it. To give you a sense of how huge this event was for Graffiti Archaeology, let me drop some statistics. Flickr users shot, uploaded and tagged more than 5,000 photos during the open-house weekend. Of those, I have culled and downloaded over 800 exterior shots, coming to a total of 1.1 gigabytes of unprocessed photos. I’ve merged about a hundred of these into the 30 layers you see here. The rest I will continue to sift through for interesting moments over the coming weeks. Graffiti Archaeology has been featured in an art history textbook: Living with Art , 8th Edition, by Mark Getlein. It’s a handsome book, thoughtfully written, and illustrated with color reproductions of hundreds of works of art. Our project appears in the section on graphic design, as an example of good design bringing interesting information out of a cloud of data. Nearby in the same chapter are examples of work by Edward Tufte, Ben Fry, and Martin Wattenberg, as well as Paul Rand, Albrecht Durer and Toulouse-Lautrec—all artists who have been a very direct inspiration for me. What an honor to be listed alongside them! Florencia ’71. Photo by KID DEUCE. That quip may be largely true these days in San Francisco, but it was not always so. 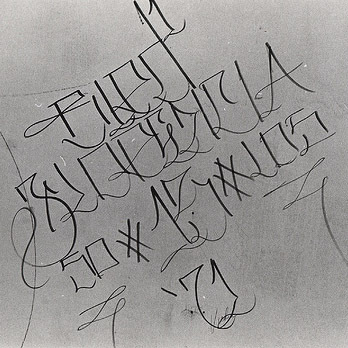 Flickr user KID DEUCE has just posted an amazing set of photos of classic gang tags from East LA in the 1970’s. The calligraphy in some of these is stunning. You can see the origins of Chaz’s Cholo style here, and at the same time, you can see where SF gang graf got some of its basic ideas, even though it has lost most of the style. Check it out. Update: Two new links on this subject. There’s Rekoe’s photoset of Chicano tags, shot by Gusmano Cesaretti, and also a great set of murals on BrownPride.com. January 1, 2007 on 7:54 pm | In global news | Comments Off on Happy New Year! A little holiday sentiment, brought to you by Kode HTK of San Francisco. Look for lots of exciting new stuff to appear in this spot in the coming year!